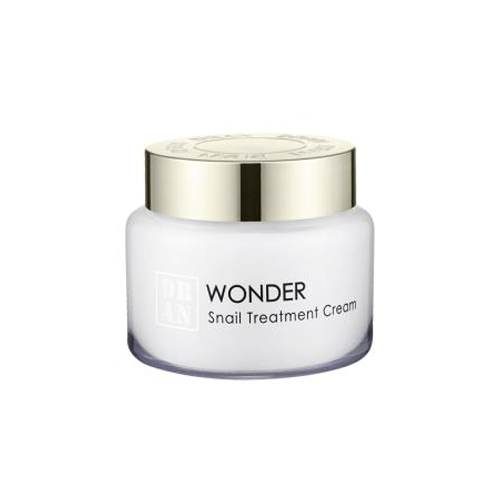 D’RAN Wonder snail cream delays the aging process of skin tissues and protects the skin with antioxidant action. Snail secretion filtrate and Silk worm restores the deep luminosity of young-looking skin as they nourish the skin at the same time. Delaying the aging process of the skin tissues and protects the skin and restores the deep luminosity to young looking skin. It regenerates damaged skin, pigmentation, scar tissue and reduces the signs of aging significantly. In 1980 a Chilean family established a snail farm with the intention of exporting snails to Europe for gastronomic purposes, but the family discovered that when handing the snails, the skin on the farmer’s hands became extremely soft. Since then, dermatologist studied and found that injuries and cuts caused by the sharp snail cages healed quickly without becoming infected and didn’t leave scars. Snail mucin has become popular as a cosmetic ingredient and skin care products worldwide. Mucin: the sticky mucus of snail contains abundant Chondroitin sulfuric acid that has power of holding moisture as it provides abundant moisture to the skin. It not only offers amazing smoothness, but also protects the skin from external irritation while it enhances the skin barrier. Snail Mucus: Anti-wrinkle anti-aging delaying the aging process of skin tissues. Protecting the skin as it forms skin barriers for hydration and protection of moisture-loss. Helping to promote elasticity and reducing the aging process, regenerating damaged skin. Silkworm Cocoon: A powder protein called sericin is extracted from the silk fibres which assists dehydration and prevents dehydration and boosts the moisturizing property’s in other ingredients and is a strong anti-aging compound. Argania (Argan Oil): Refered to as liquid gold. Creating a moist and soft skin providing nutrients as it contains Vitamin E, lionolenic acid, unsaturated acids assisting in combatting and reducing wrinkles and aging. Aloe Vera: It Moisturizes the skin enhances the appearance of dry or damaged skin, restoring subtleness, reducing flaking, removing wrinkles and giving the skin a healthier and younger look. It is a large resource of vitamin E, providing healthy skin. It reduces damage of the skin which is caused due to continuous itching and is an anti-aging and healing agent. It is also used for treating acne. Camellia Extract: It contains Polyphenol epigallocatechin-3-gallate (EGCG) and is widely known for their anti-carcinogenic and anti-oxidant abilities. Diminishing appearance of wrinkles and sagging skin and slows down the visual signs of aging. Niacinamide: Made from niacine vitamin B3. Treats skin aging has anti-inflammatory properties preventing moisture loss, stimulating the production of collagen, as collagen cells decline with age causing wrinkles and sagging skin, assisting in slowing down the aging process. Jojoba Oil: Is unique as it closely resembles Sebum so it acts as a natural skin conditioner. Sealing the moisture in the skin and creating an effective barrier to external elements. Reducing oiliness in the skin. The sebaceous glands respond to it by down regulating sebum production. It has an anti-inflammatory effect that can counter seborrheic dermatitis too.